Jacob Hanna/Contributing Photographer Madeline Bay, deputy chief of police at Binghamton University’s New York State University Police, led an active shooter simulation on Friday. 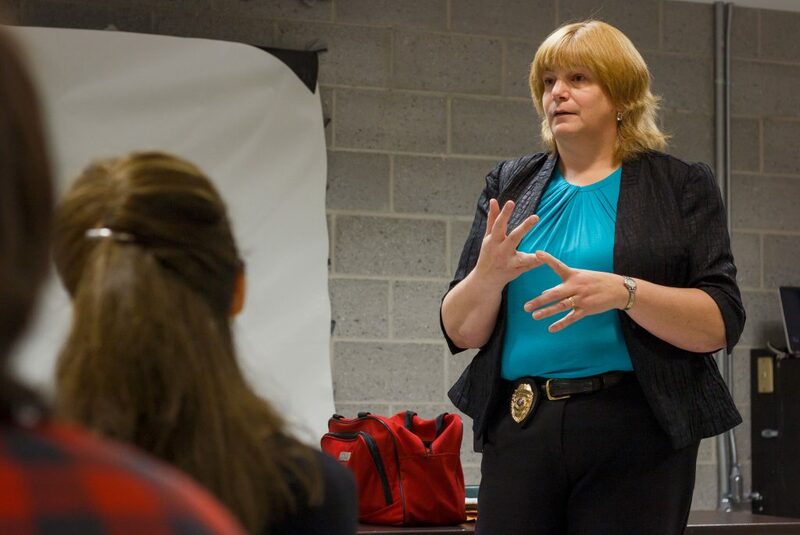 The demonstration of an active shooter situation, organized by Madeline Bay, deputy chief of police at Binghamton University’s New York State University Police, simulated what an active shooter situation would be like for attendees. The training, held Friday, Sept. 15 on the third floor of University Union West, used the simulation, discussion and a video to teach attendees about mass shootings and how to survive an active shooter situation. According to Bay, UPD has been training students, faculty and staff for years on this topic. A mass shooting is defined as a single incident in which at least four people are killed or injured. According to Mass Shooting Tracker, a database that catalogs such incidents, there were 477 mass shootings in the United States in 2016. There have been 239 school shootings since 2013, according to Everytown for Gun Safety, a nonprofit that advocates for gun control. Anreka Gordon, risk management coordinator at BU’s Risk Management and Administrative Compliance office, said she attended the event to learn the best protocol for dealing with active shooters. One important tip is to look for warning signs such as violent behavior, suicidal tendencies and a fascination with guns. If a shooting does occur, though, whether it’s on campus, at Walmart or a movie theater, people need to be prepared, according to the presentation. Learning the location of entrances, exits and possible hiding spots, as well as how to react to police, can save lives. Shootings are often over in minutes and shooters target unlocked rooms. Depending on the situation, running away, hiding or ganging up to fight the gunman can be the best course of action, according to Bay. These decisions can be affected by how informed and prepared a person is before an active shooter situation actually occurs. Attending active shooter training sessions, watching videos about how to respond to active shooter situations and starting a conversation about active shooters among faculty and students on campus can change a person’s response so that they are able to take action quickly, and not be crippled by panic. Elizabeth Mozer, an assistant professor of theatre at BU, said the training session influenced her choice to implement some of these strategies. According to Bay, the chance of a person being in an active shooter situation is about equal to an individual’s chance of being struck by lightning. Nevertheless, it never hurts to be prepared. “At UPD, I’d rather get a thousand phone calls about someone who seems weird, and a thousand false alarms, than somebody not calling and a tragedy happening,” Bay said. Yuri Lee contributed reporting this story.